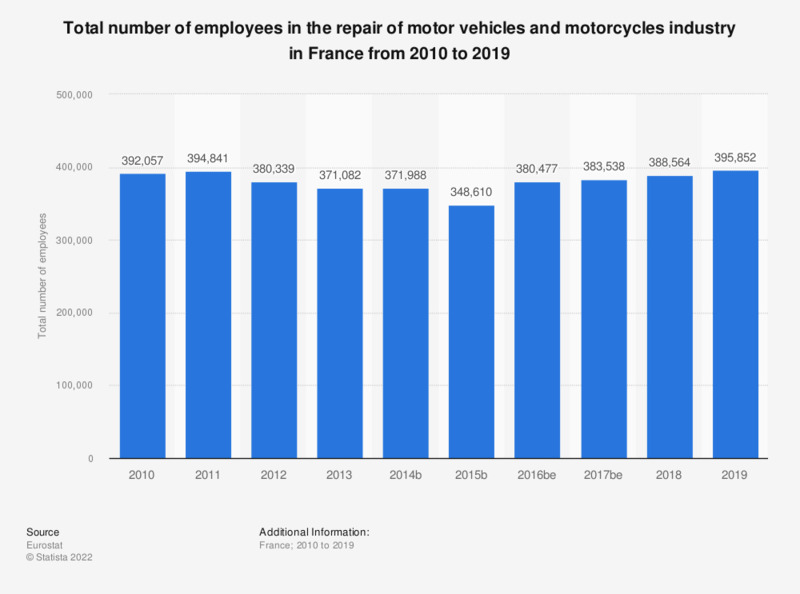 This statistic shows the total number of employees in the repair of motor vehicles and motorcycles industry in France from 2008 to 2015. In 2011, the repair of motor vehicles and motorcycles industry employed 394,841 people. The source adds further explanation: "Number of employees is defined as those persons who work for an employer and who have a contract of employment and receive compensation in the form of wages, salaries, fees, gratuities, piecework pay or remuneration in kind. A worker from an employment agency is considered to be an employee of that temporary employment agency and not of the unit (customer) in which they work." Data coverage corresponds to code G45 of the NACE_R2 of economic activities, which is wholesale and retail trade and repair of motor vehicles and motorcycles.